The primary function of a wine cellar is to store wine at a controlled, chilled temperature. For those who are more eager to express their love of fine wine, there are unique and interesting ways you can combine the primary functionality of a wine cellar with design that speaks to the true reflection of your lifestyle, culture, and personal tastes. For those who are deeply invested in nurturing their passion for wine, why not invest in a home cellar you can be proud of? The question is, are you looking to purchase a more affordable wine fridge? Build a simple functioning wine cellar? Or are you looking to design your own custom fully stocked wine cellar that looks as prestigious as a mountain of leather bound books stacked behind a professor’s desk? Roughly 8.7% of affluents living in North America have their own at-home wine cellar. However, that number is sure to climb steadily due to new innovations in design and the appeal of having a truly unique wine cellar of their own. What Goes into Great Wine Cellar Design? Meeting the requirements of a proper wine cellar can be tricky in some homes. That being said, it is becoming increasingly easier to get creative with new technology and innovations in wine cellar layouts and design. For instance, it is much easier to seal off and cool an enclosed room with a glass door, or a glass room than it was 30 years ago. Where wine cellars have traditionally been stored in a cool dark part of a basement, more wine is being stored in kitchens and other unconventional parts of the home. Cellars have a completely custom feel and oftentimes get designed in with the rest of the house in order to become a focal point or eye-catching element of the home. Similar to a custom piece of art, a custom wine cellar becomes a talking point and a way to truly express your love of fine wine. In a recent project, we at Crayon Design converted a walk-in closet in a condominium into a gorgeous walk-in wine cellar. 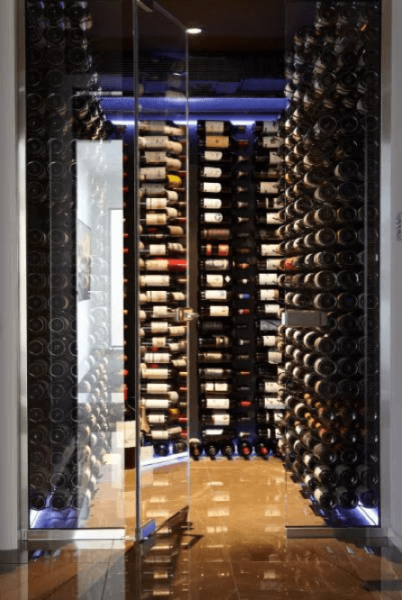 This proves that you can convert any area of a home or condo into a functional and aesthetically pleasing wine cellar. You can see the finished product in the picture on the right or read more about the custom wine cellar project here. Finding the right temperature in your home to store your wine can be a big balancing act. If the wine storage area in your home is usually experiencing minor changes of a few degrees, there should be no problem. However, if the temperature is changing rapidly by larger increments, the liquid in each bottle will expand and contract, possibly resulting in seepage or the cork being pushed out of the bottle. The ideal temperature for wine storage varies between 7 degrees and 18 degrees celsius. 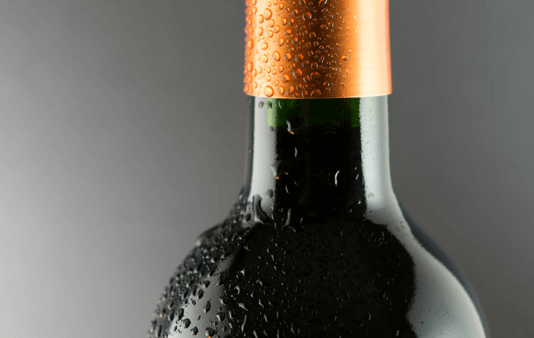 It is vital to ensure your wine is kept at a consistent and cool temperature. If kept too hot, wine will likely age more quickly, and result in flat flavours and aromas. Too cool temperatures and lack of moisture in the fridge could lead to the drying out of the cork, which allows air to seep in and ruin the wine. The reason why most wine is stored in a cool dark home wine cellar is due to the absence of light. 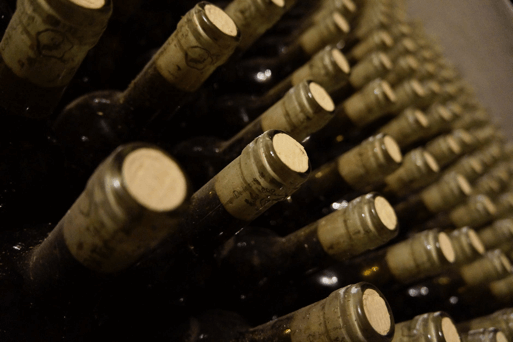 Prolonged exposure to light can create issues when storing wine for long periods of time. Household light over time will eventually cause the labels on your wine bottles to fade, and the UV rays from the sun can eventually cause your wine to prematurely age. Wine bottles typically come in dark green, in order to prevent ultraviolet light from harming the wine. A well-conditioned wine cellar will feature relative humidity levels ranging between roughly 55 and 80 percent—ideally 70 percent humidity on average. Any less humidity could result in the fading of the wine bottle labels, and drying out of the cork. When humidity levels run over 80 percent, you can run into the issue of your wine collection becoming damp, thus susceptible to mold and mildew. In those situations, a dehumidifier can become necessary. It is important that the wine is stored in an odour-free environment. Proper ventilation is crucial. Ventilation will keep your wine cellar free from any excess moisture, odour, or possible mold build up over time. If there are any persisting odours, they could affect the integrity of the wine. Wine is typically stored on its side so that the liquid is kept against the cork. The theory is the wine will keep the cork from drying out, preventing seepage and cracking of the cork. Screw caps and bottles featuring other types of closures don’t necessarily always benefit from being stored on its side, but it does create more storage space. If you’re looking to install a testament to your appreciation for fine wine, consult the interior design team at Crayon Design.